Fall means thermal shirts ($9 on sale right now at Old Navy) and the leaves changing from green to reds and golds and it means dressing up for Halloween. It means rainy Friday nights cuddling with the pups watching Christmas movies (it was November pretty much so that’s totally allowed) and it means the transition to Winter. So just like sinking into a hot bubble bath, this weeks Monday Must Have’s bring comfort and relaxation to my life. Work BFF– Everyone needs a work bff to laugh with, get water with, throw tantrums at, jump out at you and make you scream (okay maybe not this one), and have general debauchery and shenanigans. I have an amazing work bff and now we get to go through the whole30 together. While I already have a really amazing workplace, having my bff there makes everything better and means one of us is always ready and willing to go shopping on lunch or switch off Starbucks runs. Reading this article in the Huffington Post, there are a lot of great reasons having a work friend is actually highly beneficial to the office, so, really it’s your duty to find someone to have slop buckets with and eat at spider table. Don’t ask, just go find the Meredith Grey to your Christina Yang. Smart Women– Some books just stay with you and this has been one of my favorites since I first picked it up. Set in Boulder, CO in the 1980’s, it deals with growing older, friendships, relationships, and has a great protagonist in Margo Sampson. Judy Blume is an honest, funny, smart woman herself and her writing never disappoints. If you want a reflective, fun, and comfortable story, this is the book. A great read, especially if you loved her other novels, Summer Sisters and Forever. Plus, sometimes I just want something real without there being something crazy or depressing or someone getting terminally ill. Angry Orchard Hard Cider-This has been around for a while but as I say good-bye to it for the next thirty days, I encourage everyone to try it or keep drinking it. There are so many ciders out there and it can be overwhelming but this one is tops. Delicious and crisp and never disappointing, Crisp Apple is my favorite and Green Apple a close second. JoeyWaffles loves the Cinful Apple and I do have to say, it’s pretty tasty. I love it in all seasons but I do have a particular fondness for it during the fall. Great with some homemade chili, salmon, ribs, okay pretty much anything, it just always hits the spot without feeling like it’s alcohol. To be honest, I don’t even care about the alcohol as much as the great flavor and crispness. 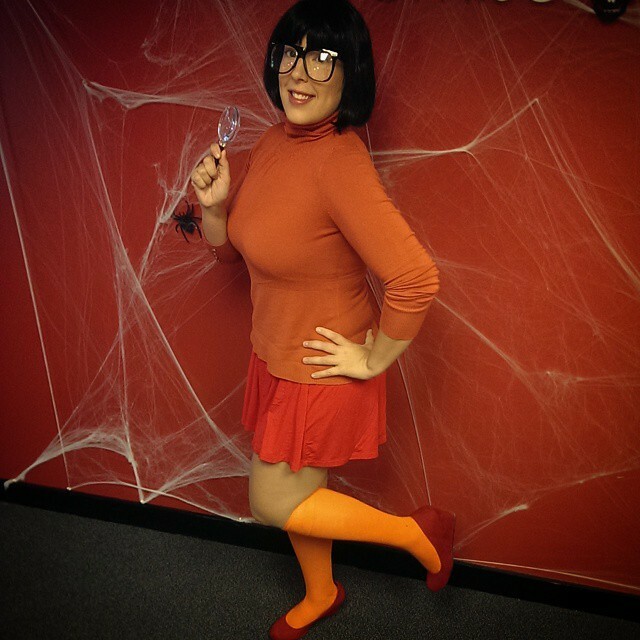 I dressed up as Velma from Scooby Doo for Halloween at work and it turned out great. Last year I was Kim Khardashian and while it was fun, it wasn’t great for working in. By EOD I was wearing some Bearpaw boots with my little black dress, not very chic. So this year fun + function won out. I am keeping the shoes since they were so comfy and on sale from $69.95. Everything I can sell or reuse (minus the glasses). Considering the Velma costume from Party City is ill fitting and $29.99 for a low quality product and doesn’t include shoes or socks, I consider it a steal. Jinxies! What did you dress up for this Halloween? What are some of your must have’s this week?